An ExploSpot suppression system installed in an armoured vehicle. South African company ExploSpot is supplying fire and explosion suppression systems to the local defence industry, with its systems being installed on a number of armoured vehicles. The ExploSpot Automatic Fire and Explosion Suppression System (AFESS) has been used in different applications since 1998, including underground mining operations, commercial and military vehicles and for gas pipeline protection. For armoured vehicles, ExploSpot systems have been shown to reduce and prevent loss of equipment, reserves and most importantly, human life. In addition, installation of an approved ExploSpot Automatic Fire and Explosion Suppression System can increase morale and increase the availability of man and machine by 69%, ExploSpot said. 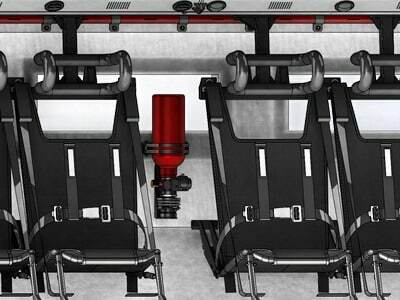 The company provides automatic and manual fire and explosion suppression systems for engine compartments, crew compartments, wheel stations, underfloor protection and fire barricades. Arend Spath, CEO of ExploSpot, said his company’s detectors can identify and verify an explosion within two milliseconds, and active the suppression system. Optical infrared detectors are installed in various positions inside a vehicle for optimal performance. They can detect and filter out false alarms such as sunlight, rifle flashes and matches. Extinguisher bottles are installed throughout a vehicle and typically contain NAF S125 gas. ExploSpot has been providing explosion detection and suppression systems for military vehicles for the last twenty years, including those manufactured by Paramount. ExploSpot’s Louis De Beer said for the last five to six years business on the defence side has been quiet but is now growing as the company attempts to grow the defence side of the business. For example, ExploSpot attended its first Africa Aerospace and Defence (AAD) exhibition outside Pretoria in September. “We are excited to be exploring these markets and are working in conjunction with ADG Mobility, Denel and others,” de Beer said. ExploSpot is busy with new vehicle developments but has legacy customers – its systems are installed on Olifant main battle tanks, for example. De Beer said he is optimistic about the defence market, especially as ExploSpot offers custom-made systems that are manufactured locally. ExploSpot started out in South Africa but now has offices in Germany, China and Australia. In the last couple of years ExploSpot has been working in the mining industry, especially coal mines where coal dust and methane explosions are a problem. About half of the company’s revenue comes from mining and the other half from defence. ExploSpot’s de Beer told defenceWeb that the Council for Scientific and Industrial Research (CSIR) has done coal dust explosion testing and found that when an explosion starts, it requires a reaction speed of 120-150 milliseconds to stop it. After an explosion is detected, gas or powder (including monoammonium phosphate) is released. Spath said that generally, an explosion develops in 10 milliseconds and needs to be controlled within 100 milliseconds. For vehicles, its detection and prevention system activates in under four milliseconds. ExploSpot has systems installed in China, which has deep coal mines with external pump stations that are susceptible to lightning strikes.